PDF417 Encoder GUI is a GUI program that runs on Windows 2000 and above. It provides a fast way to create PDF417 barcodes on the fly. From the program you can easily create barcodes either in barcode string format, or images files, and transfer the to a graphics designer or word processor. Click on this button to refresh the barcode display. This is the place to enter the data to be encoded. Multiple-line text is supported. To enter the next line, enter Ctrl+Enter. Place the barcode string in the clipboard, so that you can subsequently paste them into another application such as Microsoft Word. PDF417 Encoder GUI places both text and RTF formats into the clipboard. In applications that are capable of processing RTF (Rich Text Format), you will see a barcode immediately after pressing the paste button. Otherwise, you will see the text string instead. If this is the case, highlight the whole string and format with “MRV PDF417” font. Place the barcode image in the clipboard, so that you can subsequently paste it into another application such as Microsoft Word. The EMF created does not use font, so that you do not need to copy the font file when you view document from another computer. Note that X dimension in the resulted barcode is determined by the Module Size in the Options dialog, as the EMF format does not use the font. This section displays the actual attributes of the barcode created, including error correction level, number of rows, number of columns and aspect ratio of the barcode. Launch the HTML Help of this program. Pops up the Options dialog where you can specify additional option for exporting barcode images. See Section 3.2, “Program Options” for more information. Click on this button to export the barcode into standard image formats such as EMF, SVG, EPS and PNG. Click on this button to pop up the About dialog. This section displays the X-dimension of the barcode, in units of mils and mm. This section displays the absolute path and the file version of the encoder DLL. This is useful if you have multiple DLLs in the computer. Select the font and size from this section. Specify the barcode options: security level (0-9, 9 automatic). Compact PDF417, Rows, Columns and Aspect Ratio. If you leave all options to the default, the program selects a size that occupies the least space, often a short and wide stripe. To create a tall and narrow symbol, change Aspect Ratio to a value less than 1.0. 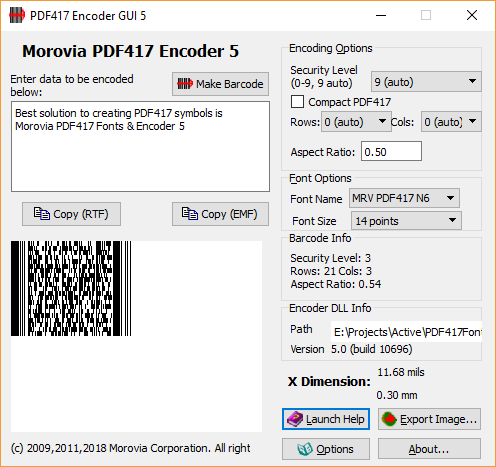 PDF417 Encoder GUI supports exporting into several standard image formats. The images generated do not contain references to the fonts so that you can move around them without requiring the software to be installed. EMF. This is the default vector graphics format used on Windows operating system. PNG. PNG is a bitmap image format widely supported by imaging software. It is the recommended image format for web graphics. BMP. BMP is the default bitmap format used on Windows platform. EPS. This format is widely used in graphics design industry. Recommended to use in conjunction with Adobe software such as Adobe Illustrator. SVG. SVG is an emerging vector graphics format. FireFox 3 supports it out of the box, as well as many drawing programs such as Adobe Illustrator. You can specify a couple of options applicable in exporting barcode images. The ratio of the height of a module vs. its with. For better readability, the value should be greater than 3.0. This value affects graphics export only, and only effective when Use value from font is unchecked. If this box is checked, the y-height will be taken from the current font selected when exporting barcodes to image files. Apply on Vector image format only. You can specify a nominal size for the module width. You can enter something like "20 mils", or "0.02mm". If unit of measure is not specified, the unit of mils is assumed. This parameter is taken only when Use value from font size is not checked. If this box is checked, the X dimension used when exporting vector graphics files will be taken from the PDF417 font and its font size, instead of the X dimension box. This will create a barcode closely resemble the one displayed on the screen. By default this box is checked. Apply on vector image format only. If you export a vector graphic images to a low resolution device such as screen or thermal printer, you should fill this field with the value of the resolution. For screen, use 96. This value makes sure that the length units are properly aligned to the edge of pixels when rasterized. 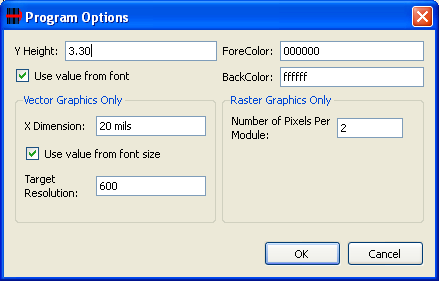 This option applies on raster images only. Specify the number of pixels of a module (the real estate unit of a PDF417 barcode). Specify the color for image background and foreground. Color values are specified using six hexidecimal digits, with the components in the order of red, green and blue. For exmaple 000000 is the value for black color, and ff0000 is the value for pure red.